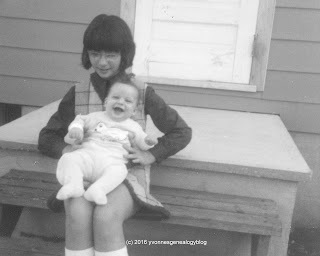 Yvonne's Genealogy Blog: Happy Birthday, Brother! When I was a little girl, I used to wish I had a big brother. For the first years of my life, there was just me and my younger sister, Marianne, at home. I don’t know why I wanted a big brother. I think it was because if I had an older brother, he could be the ‘big’ one, someone who could set an example for us two young ones. Dad immediately got me to telephone friends, family and relatives. (I think he was too excited to speak calmly.) I can still see myself at the phone table in the living room (we had the metal kind with an attached padded seat and little tabletop for the phone) calling people. I kept telling Dad it was too late to be waking our relatives, especially the out-of-province ones, but he insisted that it was OK to do so. When Marianne and I went to see Mom later that day at the hospital, we only got a glimpse of our little brother. We couldn’t see much of his features, thanks to his being all wrapped up in his baby blankets as he lay asleep in his cot, along with the other newborns in the nursery. That unforgettable day was 19 May 1970 – the day my brother was born. Happy birthday, Raymond!